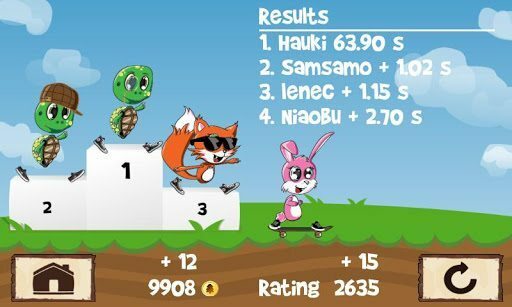 If you happen to be an iOS or Android gamer that is into online multiplayer games that feature cutesy cartoon style animal characters that run through colourful, though rather sparse looking landscapes whilst attempting to outrun other furry characters and while dodging lightening flashes and such, you might like a multiplayer game called Fun Run. Fun Run for both iOS and Android platforms is an online real time multiplayer game for both smartphones and tablets, and you get the ability to play with up to four characters simultaneously anywhere in the world. The game has recently received an update that sorts out an issue with the list of online friends, along with a few network fixes that should result in fewer disconnects, and a bug fix to resolve an issue where players would finish last but get placed differently in the early stages of the game. The Fun Run game for Android and iOS does come with a few reported problems though, for example on Android some are experiencing problems with adding friends, and when adding friends the progress bar keeps spinning whilst nothing else happens. Another Android user reports that their animals run slower than others and that the game lags quite a bit. Although other users praise the game as being a great deal of fun and very addictive. Fun Run for Android is available for devices that are running Android 2.2 and above, and is available to download to your chosen device as a free download from Google Play. Likewise, the iOS version of the game is free on iTunes. As for Fun Run on iOS, which also received that update, apparently the update claimed that Fun Run now supports the iPhone 5; however according to some users this is not the case and the game does not support the latest iOS smartphone, although I do have to say that I saw nothing mentioning the iPhone 5 on the iTunes page. Anyway, if any of our readers are playing Fun Run either on Android or iOS, we’d like to know your opinions of the game so feel free to share them to our comments area below. Four of us were playing, and I was the only one with an Android phone. I came in last place every time. When I traded phones with a friend, I was consistently coming in first or second place. There’s definitely something going on with Android or certain phones, and it’s disappointing.